Some of my fondest memories from my college years are of Sunday afternoons watching Golden Girls with my grandparents at their apartment. My grandfather laughing away at Dorothy’s snarky remarks and my grandmother giggling at Rose’s goofy “Back in St. Olaf…” stories. 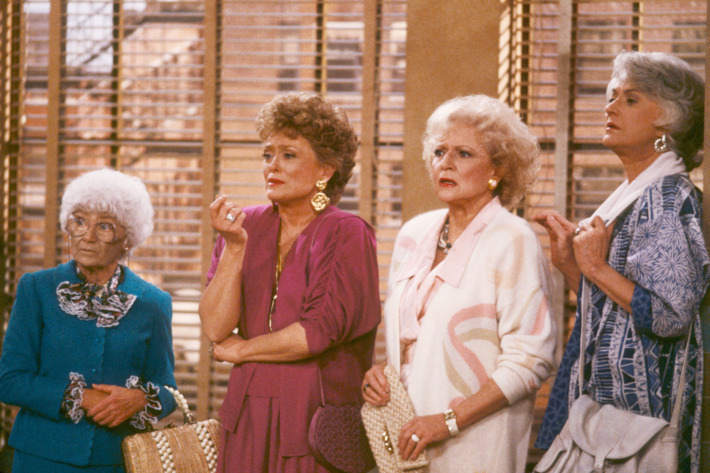 Golden Girls holds an esteemed place in pop culture history and has devoted fans across multiple generations. The comic book and movie anti-hero Deadpool was written as such a huge fan of the show that actor/producer Ryan Reynolds made a point of having Dorothy Zbornak appear in the movie! While the movie was in pre-production, Reynolds reached out to Bea Arthur’s estate to ask permission to use her likeness on a shirt in the movie. They agreed so long as he made a donation to a charity of its choosing. Reynolds made a $10,000 donation, most likely to the Ali Forney Center, a favorite of Arthur’s that offers housing to homeless LGBTQ youth (but I couldn’t confirm this). While Reynolds had this T-shirt specifically made for the movie, it did get me wondering what other Golden Girls merchandise is out there in the ether…What I found surprised me! Combining the comedy our favorite Florida Quartet with the “Who Dun It” mystery of one of the most popular board games of all time, the Clue: Golden Girls Edition is a can’t miss. I’m counting down the days till my city gets a Golden Girls themed escape room! Oh Yeah, this is a real thing. It gets hot in Florida and let’s not forget about the sun’s harmful rays. This dense vinyl windshield shade will block the sun’s rays from damaging and heating up your car’s interior. It even collapses to a compact size that can fit in most trunks! Out of curiosity, could you possibly imagine a worse back seat driver than Sophia? This variant of the classic Monopoly board game is incredibly well researched. Buy, sell and trade iconic locations from the show while moving the perfectly characterized game pieces (Stan’s toupe, Sophia’s purse…) across the board. Adult coloring books has become a large market over the past decade. I’ve been told it is a relaxing way to unwind and unplug from the chaotic world around us. So why not color pages of these iconic characters and classic scenes from your favorite Golden Girls episodes. Seriously, what could be more relaxing than coloring geriatric people and flowers in a tropical locale….I guess. I have no idea what is happening in the third picture. Golden Girls Poison Ivy Cos-Play maybe??? The Good: These 8″ licensed action figures are incredibly detailed and perfectly articulated, right down to their fashionable 1980’s conservative clothing. The Bad: Dorothy looks like she could play center on a WNBA team. And I am pretty sure I saw her outfit on an episode of Star Trek: The Next Generation. Trivial Pursuit: The Golden Girls Edition! We are talking 600 questions on 100 cards based on all seven seasons. Questions based on six categories: The Ladies, Family Matters, Who Said It?, Men of the Night, Locations, and Words of Wisdom. Get ready for some serious cheese cake wedge accumulation! But these ladies aren’t done yet! This set also includes 2 decks of Golden Girl playing cards! Each face (Ace, Jack, King, Queen) card contains a picture and quote from that character! This set also comes with a handy gold drawstring bag! ‘Why’ you ask? ‘No idea’ I answer. You thought this Golden Girl ride couldn’t get any crazier after the car sun shield? Well don’t unbuckle your seatbelt yet because I present to you the Golden Girls Chia Pet Collection! Honestly, I’m still trying to decide if I should find this product cool, semi-interesting or just flat out offensive. Maybe a little of each. In my research (ha!) for this article I found Chia Pets of all four ladies, but for some reason Sophia was going for double the price of her junior varsity compatriots. Limited edition? smaller production run? Premium for age? Least creepy looking of the 4? 3. Golden Girls Funko POPs! My own unpopular opinion here: I don’t understand the allure of Funko Pops. They are tremendously popular and are sold everywhere (although I would appreciate it if you purchased yours through Amazon.com or ThinkGeek.com) but I just don’t see what the fascination with them is all about. Pop Quiz: What game screams ‘elderly women in Florida’ to you? If you said shuffle board, you are probably right. But there are lots of bingo parlors in the Sunshine State as well. This Golden Girls Checkers & Bingo set highlights memorable details from the show. The checkers set includes 12 double sided Sophia and Rose checker pieces and 12 double sided Dorothy and Blanche checker pieces. What are you doing in the shower that has Dorothy making that face? Every once in a while there is product release that you really wish you could have watched the pitch meeting for. What was the sales pitch used to the room full of high salaried executives? Well whoever that sales person was, they deserve a raise! Because, get this, not only did he/she sell A Golden Girls Shower Curtain…they sold 2 different Golden Girls Shower Curtains! On a scale of “1” to “Super Weird“, how super weird is this curtain?!? Hint: If you answered anything other than “super weird“, you are the weird one. What did you think of the list? Are there any Golden Girls merchandise that I missed that you think should be included? Let me know in the comments below and please share this list with all your friends that are also fans of The Golden Girls .Thank you. I am 100% certain I need the sun visor! Awesome find. Call me crazy, but I have never seen Golden Girls LOL! All of these products are hilarious though! Oh my, I loved the Golden Girls growing up. I think my favorite is the Monopoly game. Great list. agree with your funko pops comment 🙂 and while I have watched the Golden Girls every once in a while, I would have never guessed there were so many products ..
That was one of my favorite shows. Never knew there were so many products out there. I like the Monopoly game. Would play that. I need them all! I love the Golden Girls but I think the sun visor is my favorite. This is amazing! I need all four Funko Pops immediately. Love this! Especially love the Funko Pops! I watch them all the time on TV Land with my mom—we always say the writing was so great! I actually said OMG WOW to every single thing on this list! Truly amazing, I do have all four of the POP figures though! Haha this is quite cool! I haven’t heard of Golden Girls but I’d love to get the monopoly one! I would definitely play Golden Girls Clue! OMG amazing! I have always loved the Golden Girls! Definitely want the Clue game or Monopoly! “Thank you for being a friend!” These are so hilarious! Who knew the Golden Girls were so prolific! Haha, yea definitely didn’t know about these products but I am so glad I do now! Love me some Golden Girls. Ha, these are hilarious! I loved that show as a little girl. I have to get that clue game!